The working drawing is the final design sheet for the product design/development section. It is a detailed sheet that shows the product as a series of accurate views, drawn to scale. The front, side and plan views are normally drawn, as they will give enough detail to ensure that the product can be manufactured. The sample working drawing below, has a front view, and two side views, followed with a plan view. 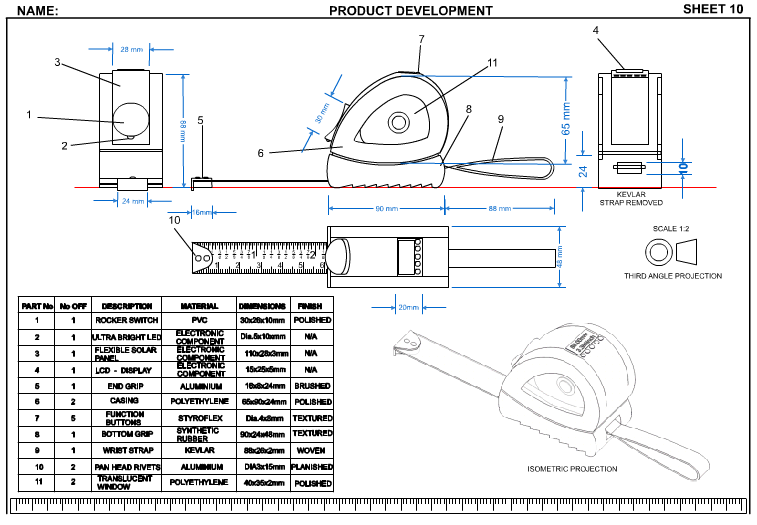 All the detail required to make the accurate prototype / model of the tape measure are on the drawing. In addition, a 3D isometric drawing is included, to give extra detail. In theory, a good working drawing will give a manufacturer, elsewhere in the world, enough detail to manufacture the product.